PARIS (Reuters) - French family-owned handbag maker Longchamp sees no slowdown in Europe in spite of the region's growing economic uncertainties, as sales reached record levels in the first months of the year, its head said. Longchamp Chief Executive Jean Cassegrain, grandson of the company's founder, told the Reuters Global Luxury Summit in Paris: "There are no concrete signs which would be causes of concern." Longchamp, one of the few fashion brands never to have posted a quarter of declining sales during the downturn, is positioned in the affordable luxury segment, with most of its products costing between 200 euros ($243) and 600. It competes with U.S.-based Coach (COH.N), a recent arrival in Paris at the Printemps department store, as well as with Lancel, part of Richemont (CFR.VX). Cassegrain said Longchamp's strong start of the year stemmed from an improved economic environment, notably in its big markets in Europe and in the United States, as well as from its partnership with model Kate Moss. Longchamp launched this year a collection of bags designed by Moss which Cassegrain said was very successful and was partly behind the brand's 25 percent rise in sales between February and April, against the same period last year. Cassegrain said he planned to prolong the relationship. "Everybody knows Kate Moss ... and she helps us get known," Cassegrain said. Handbags and shoes are often cited as the luxury goods which have resisted best the global spending slump, with the strongest brands Louis Vuitton (LVMH.PA) and Hermes (HRMS.PA) recording the highest growth rates of the luxury sector. However Lonchamp, which makes 40 percent of its turnover in France, said many of its European markets were doing well though trading in Greece, Portugal and Spain, continued to suffer. Longchamp, whose logo is a man on a racing horse, takes its name from the horse racing course just outside Paris along which the company's founder Jean Cassegrain liked to walk. 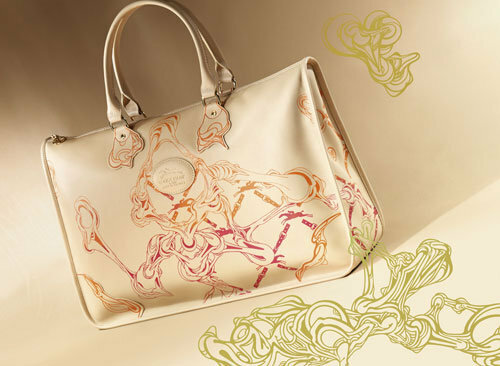 Founded in 1948, it employs now more than 1,500 people, of which 1,000 manufacture handbags and accessories in France. Two thirds of Longchamp's production is in France and one third in Morocco, Madagascar, Tunisia and China, but it says all its products meet the same quality requirements. The brand is known for its "Pliage" line of coloured fold-up nylon and leather totes, which have been a hit since their launch in the 1990s and are popular purchases online. Looking at prospects for the rest of 2010, Cassegrain said he expected sales to rise in double digit terms, or between 10 and 20 percent, after climbing 4 percent in 2009 to 260 million euros. But he added: "It is very difficult to make predictions, every time we make some, we get it wrong ... which is why it is good that we are not listed." He said the company had no plans for a stock market listing and was keen to hold on to its independence. "Our independence allows us to pursue a long-term strategy," he said. He said the company had started making ready-to-wear items, notably raincoats, but this was mostly to test the market and it had no plans for further diversification.